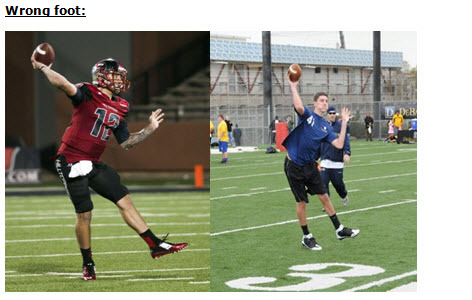 Purpose: To warm up passing arm and develop athletic QB skills. 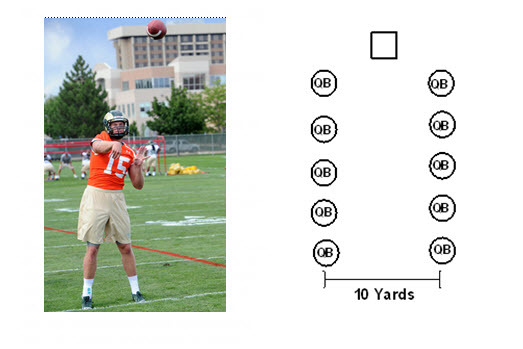 –First throw is called “10 Toes.” The QB’s feet stay planted shoulder-width apart. Twist the trunk and exchange shoulders as QB throws. –Second throw is called “Wrong Foot.” This throw simulates throwing on the run. Feet are shoulder-width apart | Place the same foot as your throwing arm slightly ahead of the other foot. QB will transfer his weight from the back leg to the front, again twisting weight from the trunk and exchanging shoulders.